A Team Folder library is integrated in Google Drive. 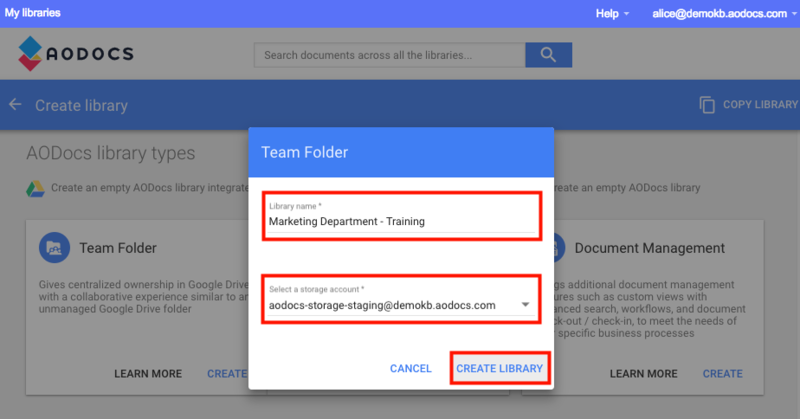 You can create Team Folders in Google Drive and the AODocs interface. – In Google Drive, you can also transform Google Drive folders into Team Folders. – In the AODocs interface, you can create a library by copy or create a Team Folder from a template. 1. In Google Drive, open the library picker. 2. At the bottom of the drop-down menu, select New Team Folder. 3. In the New AODocs library pop-up, enter the name of your new Team Folder. Note: The library name can contain any kind of character (including special characters) but the library name must be unique (two libraries can't have the same name). 4. Select the storage account for your Team Folder. Note: If you have only one storage account configured on your domain, it's selected by default. If several storage accounts have been configured, select the storage account you want to assign to this library from the list. A success message appears when the library is created. You're now ready to start using your Team Folder. Learn more: Next steps with your first Team Folder. 1. Access the AODocs homepage. 2. Press the Create library button. The Create library panel opens. The three types of AODocs library are listed. 3.Under AODocs library types, select Team Folder and press Create. Tip: You can select Learn more to view details and watch video tutorials about Team Folders. 4. In the library creation pop-up, enter the name of your new library. Note: The library name can contain any characters (including special characters) but it must be unique. Two libraries can't have the same name. 5. Select a storage account for your Team Folder. Tip: You can switch between the AODocs interface and Google Drive.